Now, with Chip Drop, arborists in the field can quickly look at a map on their phone to find dump spots for their chips. By filling out a simple form, homeowners can add their home to the same map, which all the tree companies in their city can see. All About Trees has a 100% recycle policy on our wood waste from tree removal and tree trimming. We are happy to give away our wood chips to people who can use them, if they have a convenient place to dump a truck full of them. Many of our chips are donated and used in the local tree nurseries. Many tree services dump their wood and brush into a pile and burn it to dispose of it. At All About Trees, our logs and brush from tree pruning and tree removals are hauled to a site where they are ground into mulch or compost. This practice costs more in transportation and disposal fees, but we feel the satisfaction of knowing that our wood waste will continue to be used in a practical and environmentally friendly way, and will eventually break down into biological matter. You must be within our service area. It must be delivered at our convenience. We must be doing a job near you. Our vehicles must stay on hardscape. For more expectations of Service, click here! 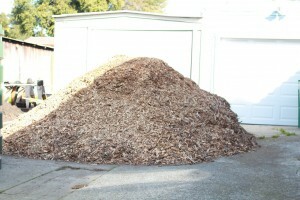 A load of mulch is approximately 10 cubic yards. This is what 10 cubic yards of mulch looks like.